Anat Ebgi is pleased to present Three Holes in a Parachute, featuring new sculptures and paintings by Jason Bailer Losh. The exhibition will be on view at the gallery through April 20th, with an opening reception on March 16th, 6-8pm. 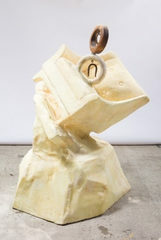 Directly informed by his paternal lineage of craft, Losh’s assemblages and sculptures often incorporate seemingly everyday materials - wood, foam, plaster - carved and reoriented to create unique experiences. A skillset passed down by Losh’s carpenter father, this exchange continues with his father-in-law who regularly mails Losh objects of his own design, which in turn become incorporated into, or inherited by, finished works. Through one set of hands, many more make, imbuing each sculpture with an emotional quality just beneath the resin finish. Chairs stand in, or sit in, as the case may be, for the pedestal. A row of chairs could refer to church pews or a stadium, but a loose circle implies a gathering, equi-sided as with the King Arthur’s court or perhaps, the convergence of kin. The balance of family life and studio practice can prove tricky. In Three Holes in a Parachute, Losh refers to extended family raising concerns about one interfering with the other. This story, among others, is not under the rug swept, but part of the furniture, an invisible feature which informs the work’s process and existence, as with an unfurled chain of DNA within an organism. Losh forgoes the functionality of his objects, upended, askew, referent but not replica. Carrying the rough, handwritten marginalia and measurements of their construction, each form rises from the partially excavated styrofoam. Similar to Michelangelo’s Bound Atlas, these sculptures deliberately claim the appearance of non-finito or in-progress, both material and memory frozen in conflict within their own origins. A domestic still life, overturned. Jason Bailer Losh (b. 1977, Denison, Iowa) currently lives and works in Los Angeles. He received his MFA in 2007 from the School of Visual Arts, New York. Solo exhibitions include those held at venues such as Zieher Smith & Horton, New York; Anat Ebgi, Los Angeles; Control Room, Los Angeles and City Ice Arts, Awareness, Kansas City, MO. Group exhibitions include Minnesota Street Projects, Ochi Gallery, Ketchum, Idaho; FLAG Art Foundation, New York; Venus Over LA; The Pit, Glendale, CA; M&B Gallery, Los Angeles; Shoshana Wayne Gallery, Los Angeles and Finesilver Gallery, San Antonio, TX.